I interrupt my Camino de Santiago series (and break my no-posting-on-the-weekend resolution) to bring you another cultural event – namely, that my hometown Denver Broncos are playing today against the Seattle Seahawks. If you’re not from the US, it might be worth explaining – the Super Bowl is by far the single most important sporting event (and television event, for that matter) in the country. Denver is a football town, making this probably the single most significant event to happen since the last time the Broncos were in the Super Bowl (when they won their second back to back championship in 1998, thank you very much). Church this morning was a sea of orange and blue (the Broncos colors, modeled by my mother in the photo above). 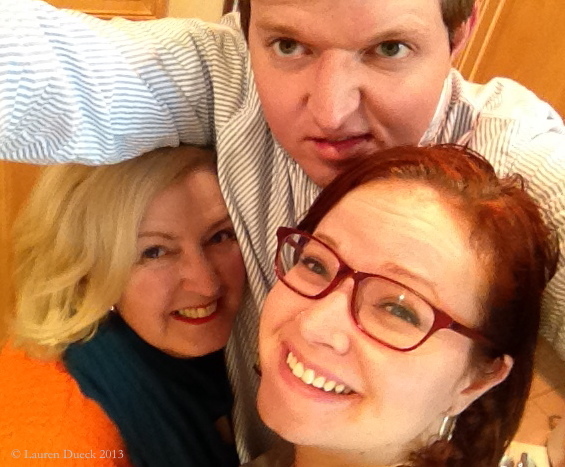 I should confess that this photo is short one brother – but I’m not sure how all four of us could fit into a selfie frame, even IF my brother’s arms are proportional to his 6’6″ height. I flew out to Denver for the occasion, and thought I’d share some family shenanigans. Stay tuned to my instagram and twitter for updates this afternoon.